Game & Watch Gallery 3 is the third game in the Game & Watch remake series for the Game Boy line. It includes five minigames playable from the start and five more unlockables, five of which can be played in either Classic Mode with the original Game & Watch characters or an updated Modern Mode featuring Mario characters along with updated graphics, updated gameplay, and music. Game & Watch Gallery 3 was re-released on the Nintendo 3DS's Virtual Console in Europe on September 25, 2014; in Australia on September 26, 2014; in North America on February 5, 2015; and as a promotional release in Japan on November 21, 2014, for those who register Super Smash Bros. for Nintendo 3DS and one of Pokémon Omega Ruby or Alpha Sapphire with Club Nintendo before January 20, 2015. Like the previous games in the series, Game & Watch Gallery 3 features a system to unlock bonus features. As before, every 200 points the player reaches in a mode of a minigame is worth a star, up to five stars per minigame mode. The player unlocks features in the Gallery Corner as they collect stars. A very hard mode called Star Mode is unlocked for every game after the player earns at least 1,000 points in Modern Mode. The player can earn a total of 120 stars. Egg – A Light Blue Yoshi must eat cookies as they pop out of an oven (a concept similar to the game Yoshi's Cookie), but it has to avoid the Bob-ombs. In the Classic version, Zeke Wolf must catch eggs laid by hens. Greenhouse – An Orange Yoshi must protect its flowers from enemies by spitting Watermelon seeds as it did in Yoshi's Island. In Classic Mode, the player has to protect flowers by using a bug spray. Turtle Bridge – Toad delivers items from Mario to Princess Peach, using a bridge of Goonies, which sometimes dive at passing balloons. The name of the minigame is from the original game, which involved a bridge made of turtles. Mario Bros. – This is far different from the original arcade game. In this game, Mario and Luigi must keep cakes (or packages of bottles in Classic Mode) moving on a conveyor belt. Donkey Kong Jr. – DK's son must traverse various stages to free his dad. Goombas, Bullet Bills, and Baby Piranha Plants appear as enemies. Flagman – In Game A, the player must copy the pattern shown by the flagman. After the player copies the pattern correctly, another step is added for the next round. In Game B, the flagman only shows one number; however, the time to react to this number shortens over time. Judge – A reaction game where the player with a number of equal or higher value attempts to hit the other, while the player with the lower number tries to run away. Lion – A game where the player must control lion tamers on either side of a cage to keep the lions inside. Spitball Sparky – A breakout-like game where the player must break all the blocks to go up a level. Donkey Kong II – In this re-release of the game with the same name, Donkey Kong Jr. must hit four keys up the screen in order to free his father from chains. As the player collects stars, they will unlock new areas to check out. Below is a list of things that can be unlocked. 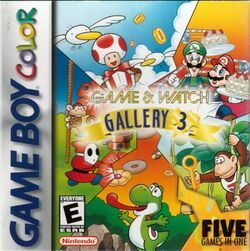 Note: Players can alternatively connect Game & Watch Gallery 3 with Game & Watch Gallery and Game & Watch Gallery 2 to unlock Game & Watch titles for the Museum with a link cable and 2 Game Boy Colors, but this was removed in the 3DS Virtual Console version. Instructions on how to link the games together are still listed in the 3DS version, but they cannot be selected. - Hard Mode in Judge is replaced with a 2P VS mode, but due to Game Boy and Game Boy Color Virtual Console games on the Nintendo 3DS not having two-player functions, this mode cannot be selected in the 3DS version. - ALL Museum titles in previous games reappear in this Museum. This is the first Game & Watch game to have the Gift mode visitable at any point. Although the Gift Function was present in Game & Watch Gallery 2, it could only be visited when unlocking a new game/function. As the player collects stars, they will unlock a feature called Secret 1. This feature describes information regarding an inverted version of the Game & Watch title Fire. When the player unlocks Secret 2, they can play the inverted Fire at any time but will not be able to pause the game. On a side note, there is no Modern version of this title, and the player cannot earn stars for playing it. Additionally, the standard version of the game is used rather than the widescreen version, likely due to the size of the Game Boy Color screen. Carefully catch the eggs laid by the hens! In this sequel, the son rescues his captured father. Get the high score without dropping a ball! Mario and DK play hockey. For 1 or 2 players. Classic NES game. Help Mario rescue Princess Peach. Break through the ceiling to reach the top floor! Nintendo 3DS Philip J Reed, Nintendo Life 8/10 "If you liked the original Game & Watch titles, this collection is a must-have. Both the originals and remakes, which combine simple gameplay and subtle strategy, are here to enjoy, and the updates are so well done that we'd recommend this game even to those who don't like the Game & Watch series. The newer versions play differently enough that you're quite likely to consider them new experiences in and of themselves. The musical and visual presentation is just fantastic as well, and the entire package serves as a relic of a truly magical time in gaming. Or, perhaps, two truly magical times." Game Boy Color Craig Harris, IGN 8/10 "It's not going to take a permanent place in the back of your Game Boy's cartridge slot, but Game & Watch is a great diversion -- and each game pak has gotten increasingly better. This one is indeed the best of the bunch, simply because there are so many extras to uncover. Just don't expect anything more than what they are -- simple games for simple technology. We salute you, Gumpei Yokoi.'" Game Boy displays a Game Boy. Super Game Boy displays a Super Nintendo Entertainment System controller. Game Boy Color displays a Game Boy Color. Depending on what Game Boy hardware the game is played on, it will display appropriate hardware for controls when selecting the mode for each game, except for Game Boy Advance and Game Boy Player, which will display a Game Boy Color regardless. This page was last edited on April 17, 2019, at 19:37.